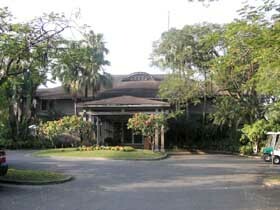 This tropical garden golf course is developed on the flat terrain in a hilly area. The fairways are wavy. Palm trees and lakes not only come into play on many holes but also adds to the beauty of the course. The greens use bent grasses which is rare in subtropical regions like Taiwan because most courses use Bermuda grasses. My freind who played in 2016 says that Both the greens & the fairways conditions are bad. It is a pity to have poor maintenance in spite of its excellent layout. A straight hole with a downhill tee shot. A long hitter can reach the green in 2 but it is not easy to do so with water on the right and a deep & large bunker guarding the front left of the green. A slight dog leg to the right with the green swung to the left. The fairway is curvy and the second shot is uphill. The green slopes from the back to the front. An astonishing par 3 over a lake. 80 % of the relatively small green is surrounded by water, so the downhill tee shot is rather intimidating. The surrounding cluster of palm trees creates an excellent atmosphere. A difficult, slight dogleg to the left. The landing zone of the downhill tee shot is narrow. A lake extends from the left corner 220 yards off the tee to the green and the left side of the green faces the lake. The green slopes from the left to the lake on the right. A challenging, very long par 3 over water. This hole is beautiful with a lake in front and palm trees behind the undulating large, deep green. A slight dogleg to the right. Palm trees line both sides of the very tight fairway. The overhanging palm tress on the right come into play, pressuring you on the tee shot. A straight, long par 4. The entrance to the green is squeezed by a lake and the green also borders the lake on the right, so you can’t hit short or slice the ball on the second shot. An almost straight, tough hole. The wide green is double-tiered and slopes sharply from left to right. The green is well protected by deep bunkers at the front with OB close to it on the right. When the pin position is on the right, the hole becomes more difficult. Overall, this is a hole requiring both distance and accuracy. A signature hole. It is a demanding, long par 3 over water but is beautiful, like a postcard. There is another hole that is 149 yards long, surrounded by water. This alternative green has no putting grass but the hole itself is about 8 meters (25 ft.) in diameter, thus you have a much higher chance to achieve a hole in one. This alternative hole really has a sense of fun. A straight par 5, reachable in 2. If you decide to lay up on the second shot, the landing area is limited as water comes into play 120 yards off in front of the green. The left half of the green is surrounded by water. It takes 90 minutes from Kaohsiung, 15 minutes from Chiai, 3 hours and 30 minutes from Taipei by car. You can book playing through an Internet golf agency. There are excellent villas, a pool and a spa in the resort. When you open a window in the villa, you can see the beautiful golf course below. The longest tees are open to pro tournaments. I asked the caddie master to let me play from the gold tees because I am a single handicap player and he was kind enough to call the club manager who permitted us to play from the tees as a special case. Note: yardage sticks measure up to the front edges of the greens, not up to the centers of the greens. 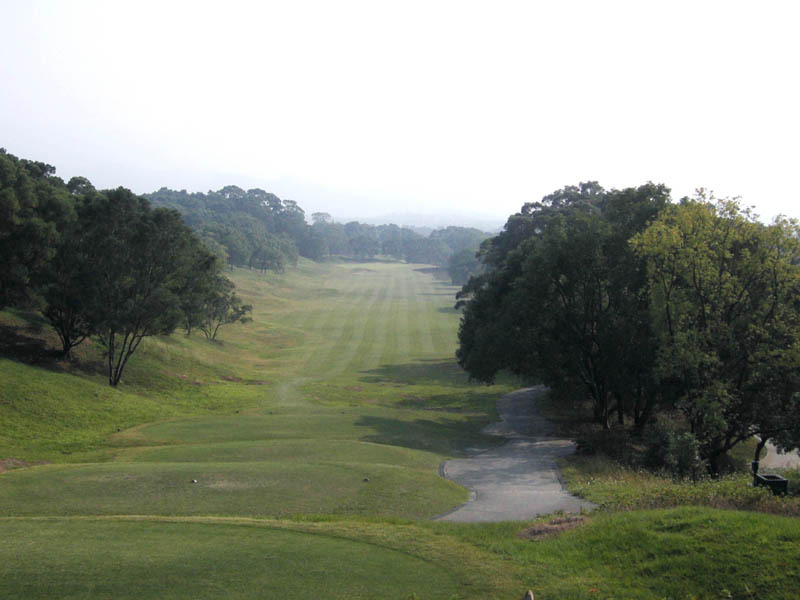 The other Shunsuke Kato designed courses in Japan are Taiheiyo Club – Gotenba Course, West Course, Karuizawa Course, Sagami Course, Takahara Course, Ichihara Course & Masuko Course, Setonaikai GC, Hanna GC, and Kyushu GC – Yahata Course. He redesigned Katayamazu GC – Hakusan Course & Kaga Course. His overseas designs are Tomson Shanghai Pudong (湯臣上海浦) GC in China, Lily (立益) G&CC, Yong Han (永漢) GC in Taiwan and Chung Ju (清州) CC in Korea.